I'm new to this forum. Just picked up my first bike. An 2001 RSV Mille. Offcourse I had to show it off a bit and let people hear how it sounds. I have started the bike 3 times in 2 days, just idling. I have no licence yet so I can't take it for a spin. This afternoon I wanted to start the bike again. I turned te key and immediately heard a clicking noise from underneath the backseat (the starter relay a assume). Tried to start the bike and it turned over but wouldn't start. Offcourse I did some research about this problem. Found out really quick that the battery is a common problem and the starter relay. 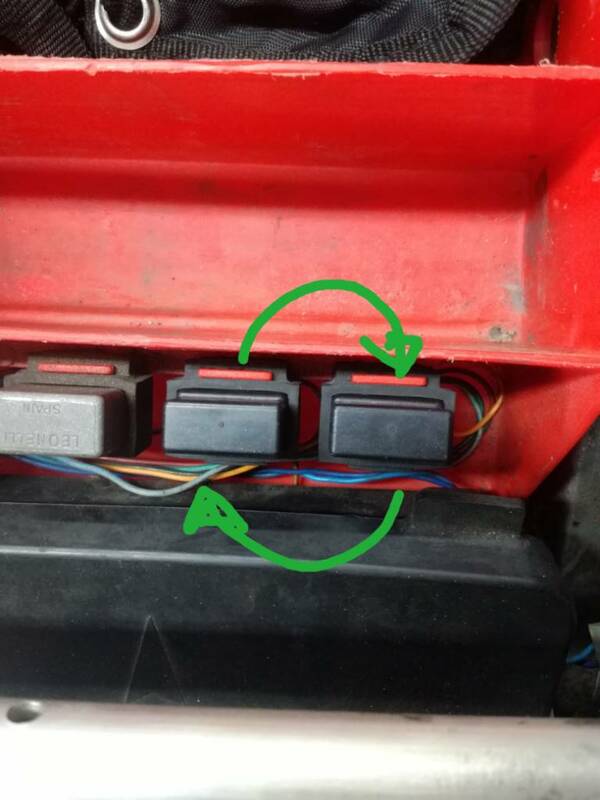 But because the bike is turning over, I don't think it's possible the starter relay is dead. Could it be that the battery died because of starting it a couple of times without giving it a change to charge? Seriously, don't try to start it again until you are sure the battery is fully charged: it takes a lot of amps to turn a big twin over, and if the engine turns over but not fast enough to start it can backfire and wreck the starter clutch. Also, don't give it any throttle until it's running, for the same reason. At very least, especially if you aren't going to be riding regularly for a while, get an Optimate charger and lead. That upgraded solenoid and battery is definitely something to keep in mind! But I dit some more research this evening en found out that the fuel pump isn't turning on when turning te key. En the clicking is coming from te relais as show in the picture. 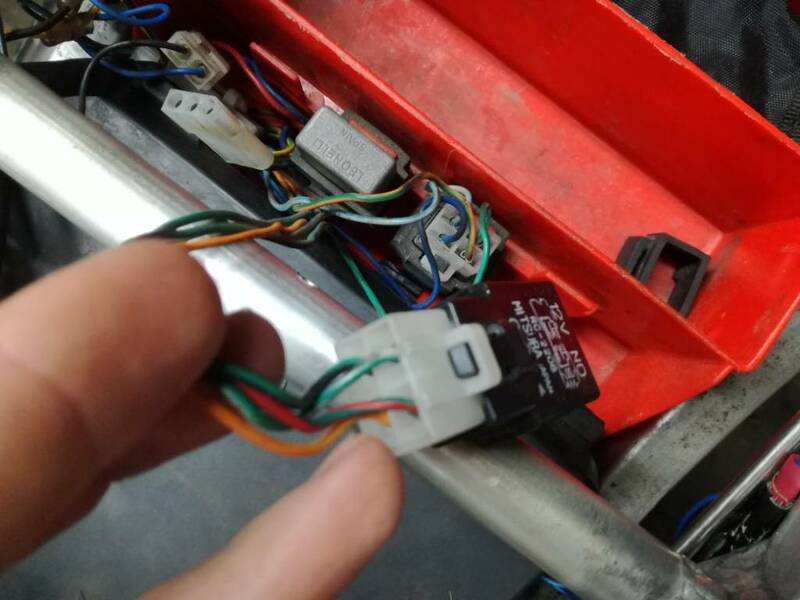 I guess this is the fuel pump relay then? So I'm guessing that relay died en that's why the motor won't start! Could I be right, and if so, where can you buy the relays? Interesting...you could try a car parts factor to see if the relay is a generic part...for instance Ducati cam belts which cost £70 a shot here can be had (exactly the same part) from Renault dealers for about £30, I believe. Failing that, aprilia performance, which I linked to in my first reply, can probably help you. They have an excellent reputation here. Or just do a Google search with the numbers on the relay. They a bog standard relays, they are cheap, but if you buy from aprilia or vw they are expensive ! I have exact same problem, did you find anywhere that sells the relays? Sorry mate for the late answer. But I managed to find a second-hand dealer nearby who had these relais in stock. But you can also just buy them new, or probably also second-hand from ebay. Just look for "rc-2208 relais" and you should probably be able to find something. Also to give an update about the fix. I replaced the relay that was clicking with the one I bought. Tried to start the engine but still a clicking noise from the same relais! Just to be sure, I bought 2 second-hand relais in case one of them may be broken. But also with the second relais it kept clicking. Then, and don't ask me why, I switched the two relais witch are next to each other, and BAM. Fuelpump was priming, no more clicking and the bike started right up. Just curious. What were the symptoms of your fuel pump going bad? It did the same as yours cutting in and out randomly and then just gave up, it turned out to be a small break in the wiring loom that runs from the fuel pump to the loom connector. I've literally just fixed it with a new loom as it broke down on the way back from the Silverstone GP lol. The new loom was £62 from ultimateparts and now it sounds alot more powerful when priming. The break was under the plastic covering the wiring that runs from the pump the loom so might be worth a look there mate.